The Motiti Rohe Moana Trust, on behalf of Nga Hapu o te Moutere o Motiti, has requested a 2-year temporary closure to the take of all fisheries resources, in the fisheries waters within 3 nautical miles of a point on Astrolabe Reef, Bay of Plenty. The Ministry for Primary Industries (MPI) invites written submissions on the request from persons having an interest in the fisheries resources concerned or in the effects of fishing in the area concerned. 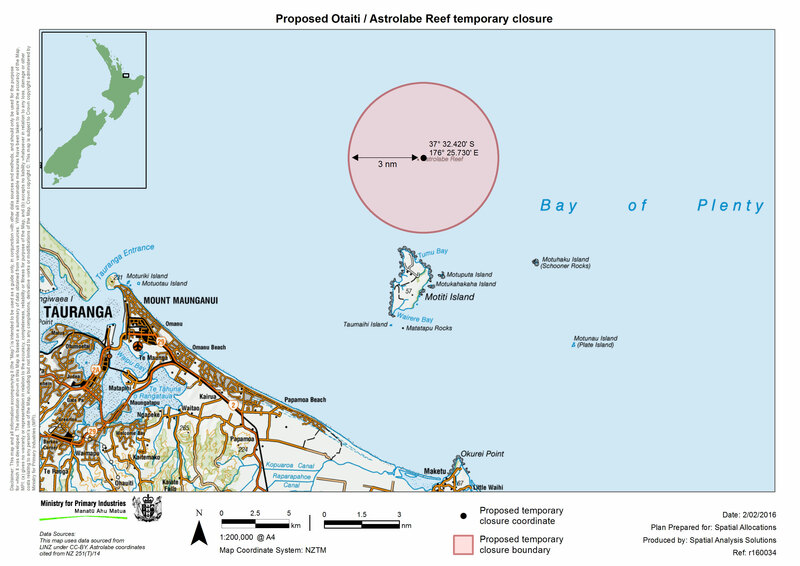 The proposed temporary closure includes the fisheries waters within 3 nautical miles of a point on Astrolabe Reef, Bay of Plenty, at 37°32.420'S and 176°25.730'E. The proposed area is about 97 square kilometres. The closing date for written submissions from persons having an interest in the fisheries resources concerned or in the effects of fishing in the area concerned is Monday, 14 March 2016.